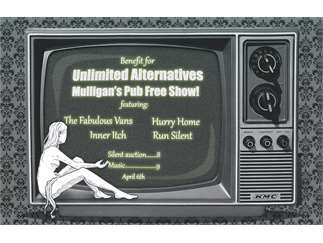 GRAND RAPIDS, Michigan – Unlimited Alternatives, along with the bands “The Fabulous Vans,” “Hurry Home,” “Inner Itch” and “Run Silent” invites the community and public to a benefit concert being held at Mulligan’s Pub at 1518 Wealthy Street, SE, Grand Rapids, Michigan, on Saturday, April 6, 2019, beginning at 8:00 p.m. There will be a silent auction beginning at 8:00 p.m. and music at 9:00 p.m. All proceeds will benefit Unlimited Alternatives. The event is free and open to the public. Unlimited Alternatives is a Non-Profit Drop-in center in Kent County, MI. It is a place where we accept all people from all walks of life. Serving a population of people who have mental health issues or substance use disorders. We provide a place to go to do your laundry, take showers, get a meal or talk to a Recovery Coach/Certified Peer support specialist to aid in your recovery process. We serve up to 100 people a day and believe strongly in community and treating everyone with the dignity and respect they deserve.